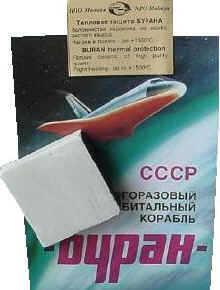 We are pleased to have obtained actual NASA & Russian Space Shuttle Thermal Heat Shield Tiles. The NASA tile was made in the late 1970's for Columbia, the first shuttle to fly in space. Thermal tiles are made of a foam glass material. Each Shuttle contains more than 34,000 separate tiles, each specifically cut for its own location. Not many know this but the Russians have a space shuttle themselves, it's name is Buran. The ship looks very much like the American shuttle and the Russians admit borrowing the blueprints. This tile was made for the Russian Buran Space Shuttle which is very similar to the NASA Shuttle tiles. Both the U.S. & Russian tiles are made of a low-density, high-purity silica fiber (derived from common sand) insulation that is made rigid by ceramic bonding. We have been fortunate enough to actually acquire several thermal tiles which were taken from one of the 5 original Buran Space Shuttles. The tiles are designed to protect the Shuttle when reentering the Earth's atmosphere. Because 90 percent of the tile is void and the remaining 10 percent is material, the tile weighs approximately 9 pounds per cubic foot. The tiles vary in thickness from 1 inch to 5 inches. The variable thickness is determined by the heat load encountered during entry. Generally, the tiles are thicker at the forward areas of the orbiter and thinner toward the aft end. A tile taken from a 2,300º F oven can be immersed in cold water without damage. Surface heat dissipates so quickly that an uncoated tile can be held by its edges with an ungloved hand seconds after removal from the oven while its interior still glows red. We own one of the World's Largest Space Artifact Collections. America's #1 Video / Data / Disc Company! Our Customers Include: IBM, NASA, CNN, Penn State, Raytheon, U.S. Navy, Compaq, MTV, Bloomingdale's, Boeing, U.S. Postal Service, Intel, Estee Lauder, U.S. Coast Guard, NYU, Wang Computers, Hewlett Packard, College of Aviation, Henry Ford Health System, U.S. Naval Academy, Apple Computer, U.S. Dept. of Energy, Sunbeam, Ohio State University, National Park Service, Universal Video, Wolf Camera, Sea Ray Boats, Allied Aerospace, Westinghouse, FEMA, John Hopkins University, U.S. Department of Agriculture, and many more. further enhance the learning experience for kids of all ages. a privately owned company located in Florida. Our purpose is to bring new technologies to the youth of America. There is never an admission fee or cover charge. Copyright© High-Tech Productions All rights reserved.